Getting married? Then you're probably trying to decide on the endless bridal hairstyles you can choose from! Hair is so personal anyway, but when it comes to your wedding day, it's a defining decision that reflects the atmosphere of the entire wedding. For long-haired brides, here at the Black Horse Inn, we've found three trends over the years that brides gravitate towards. Each one is beautiful, and each has variations that make your wedding day uniquely your own. Let's take a look. Glam--There are so many ways to glam up your hair! But for this post, we'll take glam in the direction of old Hollywood. Always stylish, we've seen brides borrow their inspiration from the cuts and styles of the 1930's and 1940's. With finger waves, rolls and elegant waves, whether you wear it up, down, or somewhere in between, blending vintage with a touch of modern is always a timeless look. Add an elegant wedding dress, and voila, perfection! Straight--Super healthy hair worn down for a wedding is its own adornment, especially when it's sleek and shiny. 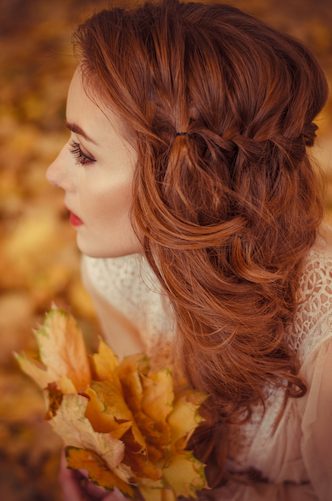 One of the variations we've seen on wearing long hair down for a wedding is the half-braided crown hairstyle. A more rustic style, it's an added dimension of romance. There are endless variations on this style that include half braiding at the back of your hair, allowing the rest of your hair to simply flow. No matter what style you ultimately choose, it's always a romantic one. Beachy Waves--This is another hairstyle that can be worn as a half updo or simply in gentle waves. You can make this style more casual or add some adornments to your hair to add more glamour. Either way, it's effortless beauty! From your hairstyle and makeup to your dress, make the biggest day of your life everything you dreamed it would be. Here at the Black Horse Inn, we offer a stunning wedding venue for your big day.